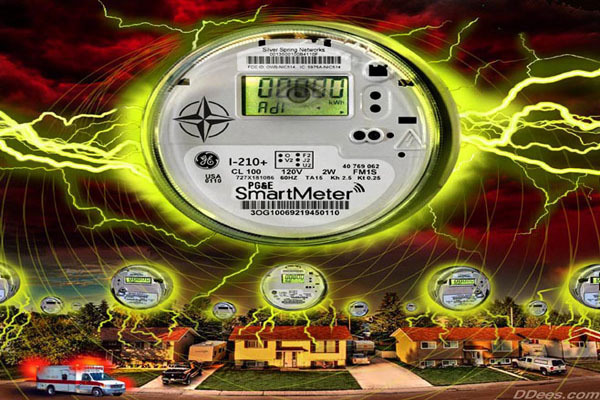 With the recent release of the documentary film “Take Back Your Power” by Josh del Sol, the conversation surrounding the risks of Smart Meters has escalated to an entirely new level. This may very well be the catalyst that causes this global issue to reach a tipping point. A steady stream of research and concerns continues to be met by the deaf ears of the power companies and the establishment. The film brings to light not only the anecdotal experiences of individuals who are experiencing everything from minor discomfort to even death as a result of smart meters. Blood samples analyzed under a dark field microscope clearly show the immediate damaging effects of smart meters on human blood cells. There can be no question from these results that these devices are not as benign as we have been led to believe. Even if we were to overlook the short term health concerns of smart meters, we cannot deny the long term implications of this technology. Ultimately, these meters will serve as the foundation upon which wireless networked household appliances will communicate using similar microwave frequencies. The power company, and whoever they sell their data to, will know at what time of day you run your dishwasher, when you’re home and when you go to bed at night. One piece of technology that has been proposed is a television that would not only report what show you’re watching, but also your eye movements, facial gestures and even what you’re saying to each other while watching the show. All of this is said to be a way for advertisers to better target products to your preferences. But, one cannot deny how this can be misused by corporations and governments to invade our privacy. Do we really want them to know what we are saying in our own homes? And imagine the health implications of multiple microwave transmissions going on within your home all day, every day when a single smart meter has already been conclusively shown to do substantial harm. So what about those who don’t notice anything different from your Smart Meter when compared to a standard meter? Josh del Sol, maker of Take Back Your Power, says that everyone is affected by these frequencies, but some are more sensitive and will notice it sooner. However, in independent research done by our organization, Flower of Life Center for Human Evolution in Michigan, we have determined that a small number of people are somewhat immune to it. Individuals with a stronger energy field and higher level of consciousness seem to have a greater resistance to electromagnetic fields. But for the rest of the world, there is an adverse effect to health whether you notice it immediately or when it’s too late. While there are many movements taking place all over the world to remove Smart Meters from homes, this technology is for the moment something that we have to deal with. It is always wise to approach solutions to problems from many sides. First, we must take actions to mitigate the risks of adverse electromagnetic fields. There are many emerging technologies that either mitigate or eliminate these adverse frequencies. Some, such as EMF blocking paints, will restrict the EMF from entering your home. Others such as grounding technology will help to discharge the buildup of charge in your body due to EMF. But the most promising technological breakthroughs are an entirely new and emerging field of EMF mitigation. This new understanding attempts not to suppress or limit the EMF, but instead to override it. This is another area that is under research and development through the Flower of Life Center as well as many other places in the world. The principle idea is to flood a space with a harmonious energy such that the occupants become immune to any adverse energy from sources such as microwave frequencies. In experiments, we have found that even those that are EMF sensitive felt immediate relief and a sense of well-being. This field of technology may hold the hope for the future as we experience an increase in the unconscious proliferation of wireless technologies in our world…at least until such a time as we make the transition to more harmonious frequencies to transmit information. And this time is not as far off as you might think. Another promising solution to consider is the use of foods to mitigate or reduce EMF exposure. Some foods that have shown considerable promise are medicinal mushrooms such as Reishi and Chaga, or Propolis or Bentonite Clay. Even walking barefoot on the Earth for periods of time will have immense benefits and will not cost you a penny. But you have to be careful in major cities or near a lot of smart meters, as the ground currents will be higher. In these cases, walking barefoot on the Earth may not be beneficial or could even be harmful. The important thing is that you take action now to protect your health and the health of those in your care, while we come together as a global community to solve the problem of Smart Meters. To Defuse R.F.I. ; E.M.F. ; E.M.P. ; Micro or Other Dangerous sterilizing Waves Southern Engineer a Tin Foil Vest and Crotch Protector to Put On with You Tin Foil Hat to create a Poor Mans “Faraday Cage to Protect yourself Wallet or Electronics sensitive to Electron W.M.D. Attacks and don’t forget to PRAY? A simple stainless steel mesa made from window screen grounded to the panel will reduce 95% of the emf energy these things create. However fighting your electric company with hundreds of your neighbors also works. Start an awareness program.